Social media is seen by a lot of businesses as simply “nice to have,” and for some companies this is true. It might not be the greatest medium to spend the largest percentage of their digital marketing budget, but when it comes to search engine optimization, a certain amount of significant involvement will often correspond well with the site’s rankings. Is this just because social media-conscious brands are also often putting out a lot of content, which is a ranking factor in itself? Perhaps! But though the links on the social platforms themselves aren’t weighted highly on search engines, en masse they do serve as one indication of a website’s relative authority. Not only that, but when you use social media to get your message and your brand out into the world, you can earn links from others who wield websites and those links do matter significantly for SEO. So how do we use social media to get more links? 1. Respond to requests for your expertise. If you are already touting expertise (hint: you should be) in your social profiles, people will reach out and ask if you have thoughts on a particular subject. Without asking for a link, you should always do your best to respond kindly and be as useful as possible. Many times people are writing an article when they reach out; I’ve earned my way into a few articles just by responding to questions on Twitter, in particular. The more you’re built up as an expert, the better. 2. Find people creating expert roundups and tweet at them, then add them to a list of expert roundups. Beyond just adding people to lists, engaging people who are creating expert roundups is one of the easiest ways to get a link. Just by letting them know you’re interested in being part of a roundup could earn you link in the future. Again, promoting your niche expertise will only make people more apt to link to you and network. Related: 25 Ways to Build Backlinks (Infographic). 3. All of your bio links are low-hanging links that really do matter! Also, use your description on Facebook for solid links. Even though every tweet and Facebook link post may not help your SEO, profile links really do matter and can help drive some traffic as well. Don’t underestimate simply getting on as many social media sites as possible and sharing the link to your website. Many of these profile links are do-follow. I’ve even seen people go so far as to have a resource section in the “About” or “Bio” section of Facebook or other social media sites where they allow it. 4. LinkedIn’s publications featured on your profile allow you to share relevant content you’ve worked hard on as well as create content on LinkedIn that will link to your deeper resource. I don’t suggest posting every article you ever write in your publications feature, but by taking the best and most well-thought out content you write and adding it there, you are not only getting links, but you’ll also garner some traffic if you are fairly active on LinkedIn. 5. When referencing companies or individuals, make sure to mention them as they might appreciate it and help promote or link to your resource or article. I always get a little sad when there’s a really cool piece of content where someone mentions a company but doesn’t tag them, or even when someone just mentions a book and doesn’t mention the author. Don’t you think they might want to be involved in the conversation, too? Some startups I’ve seen have gone to great lengths to help promote posts they see as helping influence people’s mindsets in favor of their service, and other companies or individuals will make an effort to link to “review type posts” or ones that mention them favorably. But they have to see them in the first place, so tagging them on social media is a great way to let them know they were included in your content. 6. Have a strategy that involves Tumblr and Pinterest as they allow links and are generally well-respected. Tumblr and Pinterest are two important social media sites because their links are high-value and better respected, to some degree, more than Facebook and Twitter links. You can even have an IFTTT (If This Then That) recipe that reposts your blog posts on Tumblr if you want to make it more automated. For Pinterest, I find doing inspiration-type posts does wonders as I always go through and pin all my images on Pinterest with very information-rich descriptions so the highly visual audience on Pinterest can find them. More than links, Pinterest drives significant traffic when wielded appropriately, so there’s another reason to focus on it in your content strategy in general. 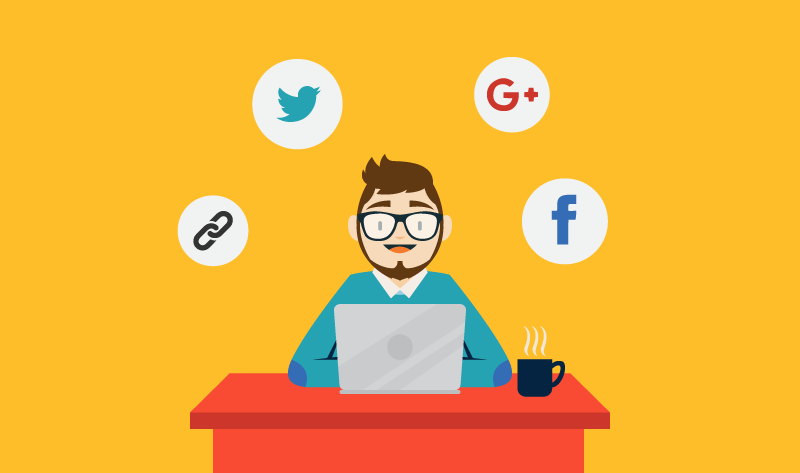 Overall, I hope you were inspired and feel more confident to be able to get links from social media, and you understand that beyond linking and traffic, social media can be an amazing tool for brand awareness. It’s not some magical beast to feel intimidated by, even if you’re an old-school marketer or someone who hasn’t been as active on social media — it’s another way to have genuine conversations and be useful to those in your tribe and in your prime demographic. You just have to be listening and ready to help. As they say, what goes around comes around, even with links. Tim Brown is a digital marketer focused on SEO Marketing Services and increasing traffic and conversions for his agency and clients.